Our Inner World Guide Michele Bernhardt reports on a healing technique designed to release trauma buried deep inside the body. We meet Peter Levine, the developer of Somatic Experiencing, and Ray, a Marine badly wounded in Iraq but now much improved as a result of Peter’s therapeutic approach. Gina Garcia’s motto is “Yoga for everyone everywhere” and her non-profit organization is seeking to bring this ancient practice to Americans who haven’t had access to it or perhaps have not been able to afford it. So far she’s attracted some powerful helpers, including Dr. Mehmet Oz and his wife Lisa. It’s been quite a while since the words “healthy” and “cheese” were heard very often in the same sentence but that is changing fast. Nutrition expert Sally Fallon Morell explains. Relax with the unforgettable nature footage of acclaimed cinematographer Louie Schwartzberg and music from Sonic Translations CD by Gary Malkin and Bruce Cryer. 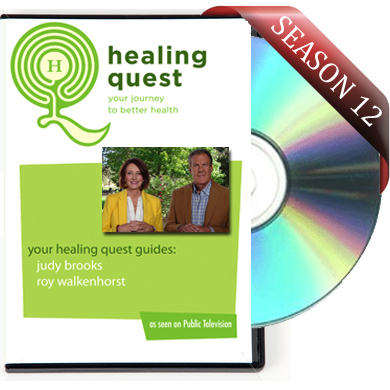 Be the first to review “Healing Quest: Episode #1204” Click here to cancel reply.